Laerdal's BaXstrap Spineboard Stretcher provides patients with a comfortable, quality solution to those who require immediate emergency spinal care. The Premium Straps for the BaXstrap Spineboard Stretcher are necessary for properly immobilising your patient. If you suspect your patient of having a spinal injury, it's important that you stabilise their spine to prevent long-term damage. 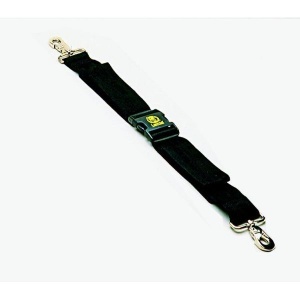 The Premium Straps can help hold your patient in place and are particularly useful if your patient is unconscious. This is because they might try to sit up when they regain consciousness. Carrying your patient to the ambulance can be a difficult part of your job, and without the Premium Straps it would be close to impossible. Your patient is more likely to fall off the Spineboard without proper immobilisation and support. The straps therefore help improve your patients' safety and wellbeing. Please note that straps may start to wear with heavy use in water or chlorinated water. The Premium Straps for the Laerdal BaXstrap Spineboard Stretcher will be subject to a delivery time of 3 - 4 working days after the point of order. For more information, contact our Customer Care Team at 020 7501 0593.